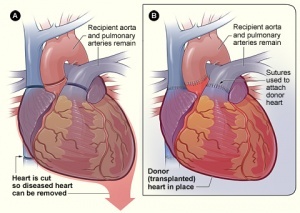 A heart-lung transplant is a major and rarely performed surgical procedure. During a heart-lung transplant, a person's diseased heart and lungs are replaced with the heart and lungs of a recently deceased donor. As with any transplant there are risks, but the procedure aims to extend or improve quality of life in suitable candidates. A pioneering heart surgeon, Dr Christiaan Barnard, performed the first successful human-to-human heart transplant operation in 1967 in Cape Town, South Africa. Unfortunately, early operations resulted in problems such as infection and rejection, and heart recipients did not survive very long. With advances in technique and development of new drugs to suppress the immune system, a majority of transplant recipients currently survive more than 3 years. A "bridge" device (assisted device) has been developed that lets certain people live longer while they wait for transplantation. A balloon pump inserted into the aorta, along with battery generator device, that can help the heart to provide blood flow to the body. This “bridge” cannot be used for long and used only in people who are critically ill and very close to getting a new heart. A newer procedure involves implanting a mechanical pump into your body to help pump the blood. This pump, called a left ventricular assist device (LVAD), can be used for months or even years. Some devices can be utilized indefinitely. Total artificial hearts are now available and have been implanted in a few patients. Besides costs, complications are still present. Successful lung transplantation has been performed since the early 1980s. The first surgeries involved transplanting both lungs and the heart together. Since then, operations have been developed to transplant both lungs, a single lung, and even partial lung (lobes). A heart-lung transplant is the only treatment available for people who have combined heart and lung failure. It is a treatment that carries high risks but can offer benefits. For this reason, it is only recommended when all other treatment options have failed. If the damage is severe in both organs, replacing the heart or lungs alone may not be possible. it does not mean your new lung or heart is failing. Most candidates for transplantation are referred to the program by their primary physician or specialist. Others come to be evaluated at their own initiative. The process begins with a call to the Lung Transplant Office. 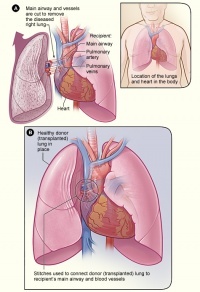 procedure for patient: For some patients, a single lung (one side, "single-lung transplant") is all that is needed. For others, both lungs ("double-lung transplant") or a heart as well as both lungs ("heart-lung transplant") are the best option. Occasionally, the decision about whether a given patient needs one lung or two will be influenced at the time of surgery, by the function of the donor, availability of organs, or the severity illness of the recipient. At the end of your pre-transplant evaluation, and after the test results are complete, the Lung Transplant Team will meet to jointly discuss whether or not a lung transplant is an appropriate treatment for you. The transplant coordinator will then notify you of the Team’s decision. Please understand that abnormal test results might require further investigation. The goal of pre-transplant testing is to ensure that you will be able to undergo the transplant surgery and recover without any significant risk of complications. The recipient's heart is removed but a cuff of right atrium and ascending thoracic aorta distal to semlunar valve is left for anastomosing to the respective parts of the donor heart.A cuff of left pulmonary artery is left in its position to protect the integrity of left recurrent laryngeal nerve. After this both lungs are dissected , dividing the pulmonary ligament and the hila except the bronchi (intact).The trachea is exposed and just divided above the carina, and the lungs are removed. then the right atrial anastomosis. The most crucial and critical part of this procedure is the removal of recipient's heart and lungs without injury to the surrounding nerves like vagus nerve,recurrent laryngeal nerve and phrenic nerve and bronchial arteries. Pulmonary function tests, a measure of your lung function, will be performed weekly in the 3 months after your transplant, and less frequently thereafter. This test may reveal the first sign of rejection or infection. Your lung function will be followed at home with the measurement of spirometry and peak expiratory flow measurements, which you will record daily at home. Any persistent decrease in these values should be reported to the transplant team.If rejection is suspected, a bronchoscopy, or lung biopsy, will be performed to rule out rejection or see if it is actually occurring. This initially involves returning to the Outpatient Clinic once a week for the first month after leaving the hospital. At this time a series of tests, including blood tests, are conducted to closely monitor the patient's progress. This is a period when medications are precisely adjusted. After this initial period of relatively intensive follow-up, patients are seen periodically as determined by their condition. While transplantation can greatly improve the quality of life of the recipients, it also demands much of them. They must become active participants in preserving their health. Transplantation has become so successful in recent years in large part through the development of new drugs, which prevent rejection of donated organs. These drugs inhibit the body's immune system from identifying the new organ as foreign. It is necessary for all patients to take immunosuppressive medication for the rest of their lives following transplant.